Ok, I’m back. Sorry for the late post but I came home to a broken computer and a forgotten password. I’ve gotten over those hurdles, now its time to plan a run! This week you’ll be running on Saturday instead of Easter Sunday. We’ll meet at 8 at Brueggers as usual but a day earlier. The route will take you up to Melrose Common, over to Swains Pond around to Lebanon St, left onto Forest St over to Main St where I’ll have water stop 1 waiting for you in the Citizen’s Bank parking lot. Since its Saturday and the bank will be open, lets move through that stop quickly! From there you’ll head out past Oak Grove T Station, up Greenwood Street to the Fellsway East. Follow the Fellsway to the LynnFells parkway to the knoll near the high school. I be there next for water stop 2. Keep going along the LynnFells until you get to Main St in Saugus, go left and run up to Nahant St. Take a left on Nahant and pop out at Nicks where you’ll find me again for a water stop. Take Main Street back and finish up your first taper run on your way to running Boston. If you’re running shorter, there are turn backs along the route in many places. Figure out how far you want to run and make a turn towards Brueggers when you need to. If you want to run longer, a typically add on for this route is just to run up to and around Pine Banks. Grab a sip of something as you run past Brueggers. Remember, because its Saturday the traffic will be heavier as we get later in the morning. Be aware. Run safe. If I don’t see you Saturday, have a Happy Easter. Are we all excited to get our legs moving along THE course of all courses? So, here’s the plan, or at least version 1 of the plan. Let me say upfront that I am not able to give you the Jim Carson level of service. I may not have an opportunity to do all kinds of fancy handouts like Jim does, but, if I do, you’ll all be the first to know. Everyone should arrive at the parking lot behind Bruegger’s at 6:45a.m. this Sunday morning. The caravan of vehicles will be leaving the parking lot by 7a.m. We have 6 vehicles right now, which gives us a few empty seats to play around with should anyone show up at the last minute. Â Car assignments are below, but one note – Joe W. needs to speed back to Melrose when he is finished with his run. He’ll be riding with Catherine. If you want to ride back with Catherine and Â Joe on the earlier side, you need to keep him in your sights along the course and be ready to go (which means making sure your dry clothes are put in Catherine’s car at the very start). Driver – Derek or Lisa, passengers – Tom G., Bill O., and Don K.
Driver – Ginny R., passengers – Sue W., Carol C., Dorota, and Michele D.
Drivers – Brian and Lois/Lisa, passengers – Tim P., Jose, Christina A.
Driver – Catherine, passengers for the ride to Hopkinton – Michele, Joe W. and Chris H. THIS CAR WILL LEAVE EARLY FROM BC. Again, cars will be leaving the parking lot at 7 a.m. Be there or be… running your miles in Melrose while the rest of us are on a grand adventure in Hopkinton, Ashland, Framingham, Natick, Wellesley, Newton and Chestnut Hill. Please take a look and know where you’re going. It is a very simple course with one major turn at the Boston Fire Station, however… we have had runners miss the turn. I don’t want anyone to add any extra miles due to stepping off course. So please, if you’re worried, study the map and at each waterstop ask about what you need to know to get to the next waterstop. We will be using the same waterstop locations as last year. I’ll have some handouts on Sunday morning, but if you want to see them, look at the blog entry for last year – Jim supplied location and pictures. Post your questions, special flavor of Gatorade/Powerade requests, and anything else you have to say here (that is acceptable to post, of course). I’ll update as needed. If there are no updates, I’ll see you all bright and early on Sunday morning. Alicia, Carol, Dorota, Christina, Katie, Audrey, Michele, Sue C., Sue W.
Make sure I know you’re coming so I can finish up a plan before week’s end. I’m so looking forward to this year’s adventure with you all! One week before we run the most miles of the training season and we’re headed out for some peaceful water views and a few hills. This is the point in our training when Jim gives some great advice about what to think about this week and next. Â Like… now is a good time to check your sneakers. Despite the snow, you must admit you’ve been running a lot. Also a good time to get your pre-race meal confirmed – what works and what doesn’t should be figured out now. As for marathon day clothes… that one is a little tougher to test out as we still need to dress for the weather that is happening now. Â So, think about all of the things you’ll be worried about come the big day and start nailing down with certainty what is going to work best – food before the race, fuel along the course, sneakers, socks, underwear (oh blush) and/or running bra, sunglasses, hair ties, BodyGlide, etc… Now is the time for experimentation if you are uncertain. Okay, so on to the route. Water views. Hills. Sounds lovely, doesn’t it? Same route as last year, so a cut and paste of Jim’s instructions from last year seems to fit the bill. 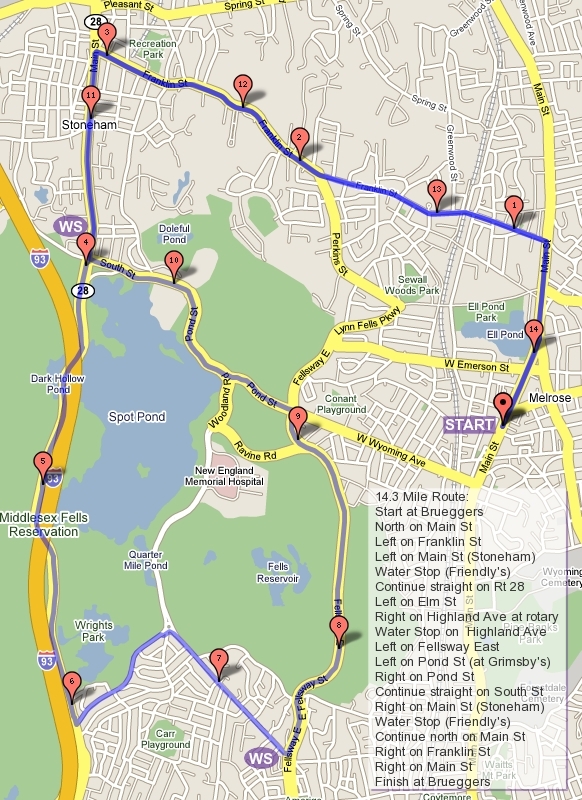 The run will take you up to Melrose Common on East Foster, over to Swainâ€™s Pond along Swains Pond Ave, right onto Lebanon, left onto Forest, Â and over towards Oak Grove. If you donâ€™t know where those places are check the map. This run has gotten a few people lost in the past. when you come up to the ponds, Swains Pond Ave turns right, donâ€™t go straight up the big hill. When Swains Pond Ave comes out to Lebanon. GO RIGHT. A few people have veered off to the left and headed into Malden. Eventually they come back, but its best not to add unnecessary miles on. When you come out of Forest St in Malden there will be a Citizenâ€™s Bank across the street. Water Stop 1 will be in the lot. The second leg of this run is past Oak Grove Station on Winter St. Run directly across to Glenwood St. Follow this curvy hilly road out to Highland Ave. Youâ€™ll recognize the paper boy at the rotary, go right onto the Fellsway East. Take those hills all the way to the LynnFells Parkway, past Grimsbyâ€™s, Dunkin Donuts, the hill into Melrose, to the knoll across from the Melrose Middle School. Thatâ€™s where youâ€™ll find water stop 2. After that stop take the LynnFells all the way to the SaugusÂ entranceÂ to Breakheart. Youâ€™ll find another water stop there. Loop Breakheart back to the water stop. Follow the LynnFells back to the knoll for another stop. Go back over the LynnFells hill to Grimsbyâ€™s, turn left onto West Wyoming, and another left onto Main St and bring it on home to Brueggers! If youâ€™re running the short route, take a look at the map, since weâ€™re looping Melrose Center for the first 7 miles you can make this one a few different distances to fit your training. There are Three waterstops that I’ll need some help with. Anyone? I know some of our comrades are headed to the New Bedford Half Marathon so best of luck to all of them! Here it is… the weekly ROLL CALL! Who is in? Ahhhhh. This week we get a nice drop down to 16 miles for the marathoners, 8 miles for the half marathons. Â Yes, you’ve just become the annoying person who remarks that you’re ‘only’ running 16 miles or ‘just’ 8 miles this week. Â Funny how perspective shifts over the course of 10 weeks. This week we do have a little challenge with our route. I’m fairly certain that Breakheart is likely still impassable. We will be changing just that portion of the run in a way that keeps to our one water stop and doesn’t go far off path. So, who is in for a little post-storm run?